One of the great parts of going to a very warm climate in the winter is that you get to experience the sun. As I was in Florida, I felt the strain lift as I basked in the warm breezes and sunshine. I was not alone as I walked the beach and sat by the pool. Tired cranky people who had been digging themselves out of the cold snow for the last few months reveled and baked and sauteed in the sunshine, me included! So, I offer a few sketches of those basking in the sun. I saw a woman on the beach with a funny canopy attached to her chair. It looked like the canopy of a baby stroller, but she attached it to her chair and sat under it. Nice face protection! I did another sketch of my son, laying on a towel. We had found a nice sandy patch with some small palm trees (which I sat under). I spent many delightful times observing the characters that came to the pool every day. Here are a few sketches I did from our balcony above. Sometimes your body revolts and you know you have spent too much time in the sun. I had this happen at a Twins Spring Training game, so instead of baking in the bleachers, I sat in the shadows and sketched people’s legs as they stood at the bar rail watching the game. 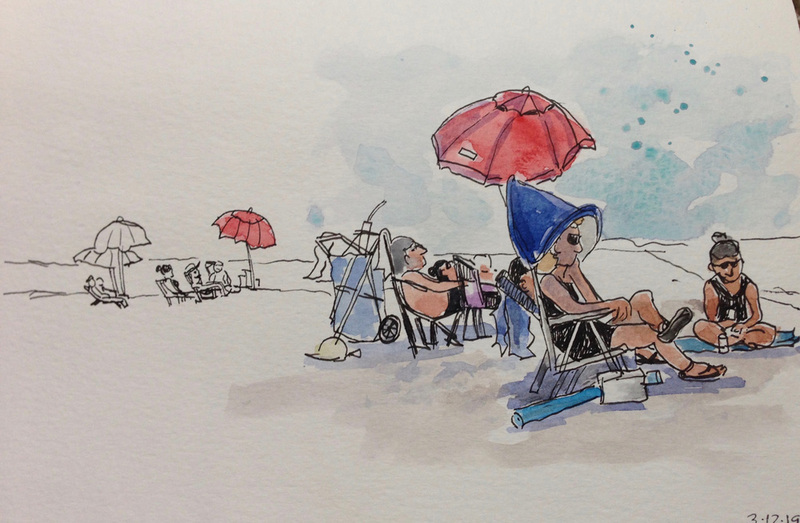 I also sat under a huge umbrella at the Salty Crab (on the beach dining, literally I was running the sand through my toes as I was eating) and sketching other diners under their umbrellas. Everyone was enjoying the warm weather! So whether you are in the sun or out of it, there are still plenty of interesting people to sketch!